Kieran Fortune becomes an instant father to a three-year-old when his best friend dies in a ranch accident. Dana Trevino, his friend's ex-girlfriend, steps in to help the floundering single dad, only to find herself falling for a man she considers way out of her league! Kayla Rickard knew falling in love with Liam O'Sullivan broke the rules of the bitter feud between their families, and she thought she could keep their impromptu marriage a secret. That was, until her pregnancy changed everything! Handsome diamond heir Dalton Drake struck a royal bargain to give shelter to Aurlie Marchand, a runaway princess in New York City, but falling in love was never part of the deal! 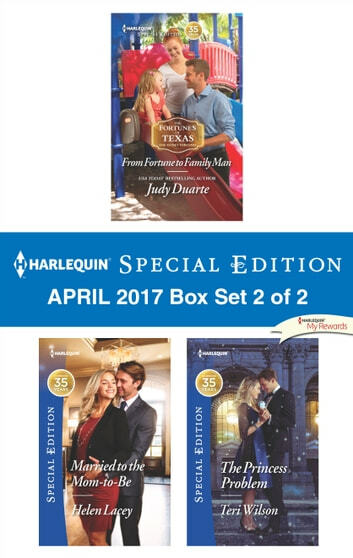 Look for Harlequin Special Edition's April 2017 Box set 1 of 2, filled with even more stories of life, love and family!